When at home, Samridhi Sharma, 19, is always curled up in a corner with her Android smartphone , either snapchatting away or browsing through e-commerce apps. Photos are a big part of her phone usage. But every single picture clicked is airbrushed with Photo Editor or other similar apps. A heavy shopper on the mobile phone, she has half a dozen e-commerce apps, a mobile wallet and cab aggregator apps. She changes her phone's wallpaper literally every week and has installed a launcher app to customise the look of her device, and introduce shortcuts. The growth in the use of personalisation apps (custom lock screens, launchers,) is a significant trend in the way Indians use apps. Even as gaming still remains the number one app activity globally as well as in India, the big story is how users in Asia and India are shifting from apps for entertainment and gaming to more utility and productivity-oriented ones such as Battery Doctor, Clean Mate, shopping apps, personalisation, travel, news and reading apps. "We work mostly on utility apps centred around photo/audio/video. The offtake in that space closely tracks the growth of smartphone penetration in the country," says Rohit Bhatt, CEO and MD of Robosoft Technologies, a mobile app developer that also has gaming apps like Spell Up, a word game, and Star Chef, a cookery and restaurant management game. According to a Cisco report, there are over 140 million smartphones in the country and over two million tablets. The report projects that smartphones will touch 651 million by 2019 in India. 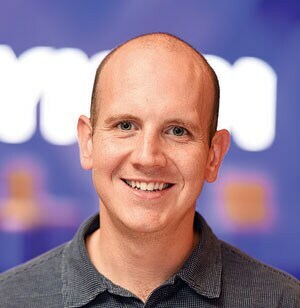 "We believe that Asia is really shifting the diversification of app use and expanding usage across board," says Christopher Klotzbach, Head of Product Marketing at Flurry, a mobile analytics company now owned by Yahoo! He describes how photo editing apps such as Makeup Plus or Beauty Cam are very popular in Asia and says, "We are starting to see users in India drive growth there in terms of sessions use." The growth of photo editing apps are of course linked to social media and the way pictures are increasingly shared over messaging applications. "You always want to look best in the photos you send to your friends and mobile users have the ability to edit photos in apps in a very easy and convenient way," says Klotzbach. 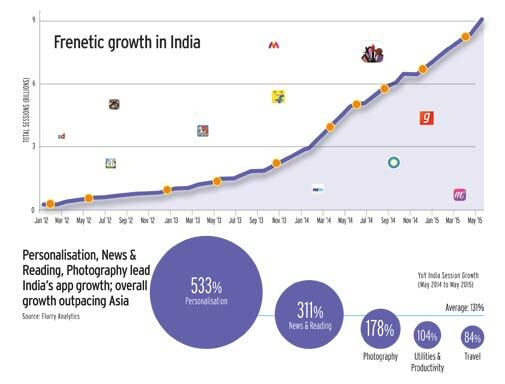 Even as photo editing apps record good growth, shopping is a huge category, in terms of time spent, in Asia. "It is second only to gaming. Nineteen per cent of users' time spent in Asia is on shopping applications. And, we firmly believe that India has a huge stake in that," says Klotzbach. Those stats - based on a usage survey that Flurry did of 42,000 apps in 82 million devices in India - must be sweet music to the ears of players like Myntra that have gone mobile app only, and Flipkart, which reports suggest will go the same route soon. "India is early to the game of shopping through apps," says Klotzbach, predicting that we will see a bigger shift in the days ahead to mobile app commerce. "In the US, two-thirds of the users prefer apps over browsers," he says. But even sweeter news for those investing in apps is the way overall app usage in India has grown. "Overall, in terms of app sessions (every time somebody opens an application), India grew year over year by 131 per cent, outpacing Asia and the rest of the world, which is pretty remarkable, says Klotzbach. "We are seeing huge engagement and huge growth in India." Klotzbach was here to host Yahoo! 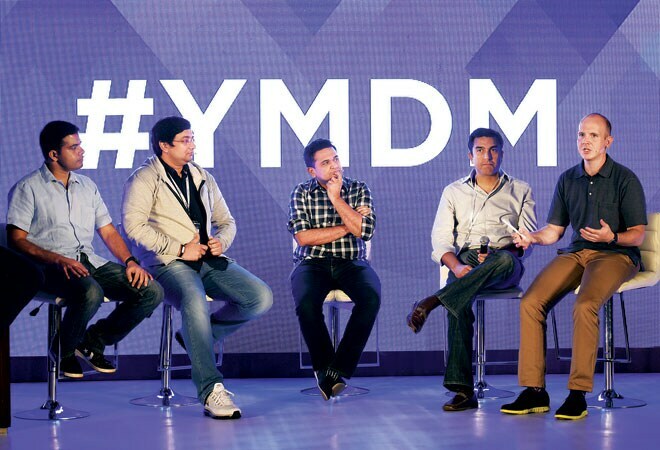 's first-ever Mobile Developers Meetup in India and share Flurry's research on how the world and Indians use apps. For the app developers it must have been heartening to hear that 2014 marked the first year that users' time spent on mobile eclipsed the daily time spent on TV. "Users are picking up applications over a hundred times a day," says Klotzbach, pointing out how from an advertising perspective it's now an absolute imperative for brands to shift their dollars into mobile apps. Already that trend is visible. Market research firm eMarketer predicts in-app advertising will grow 10 per cent faster on average than mobile web. By year-end, the app economy is expected to generate $21 billion through advertising. By contrast, only $7.93 billion would be spent by advertisers on mobile browsers. Sanjeev Jasani, Head of Digital at ad agency Cheil India, says although advertisers are only scratching the surface of apps today, the space will evolve and he's personally excited about it. "Mobile landing pages will move from plain old URLs to deep links within apps. The game will shift from app-installs to app-engagement and these will be because of the in-app growth," he predicts. "You will see more native, interstitial and takeover ads with interactive and experiential content," he says. "I think users engage 65 per cent more in native ads than they do on standard display units," says Klotzbach. Advertisers have also got a big response from video ads in gaming apps. "Video isn't a great format for gaming applications, but, during a break in a game, or a level break, app developers often put video ads and they've seen success," says Klotzbach. Games are still a big medium for brands as, surprisingly, mobile users are not averse to paying to progress in a game. "Our games are all freemium (free to download) but the user has to make purchases within the game if he wants to speed up the progress, buy items that will make his game persona look better compared to other players. Compared to the rest of the world, the monetisation of games in India is mostly via advertisements displayed within the game," says Bhatt of Robosoft Technologies, pointing out that according to Chartboost (an ad network), the Indian market was the second-fastest growing market in the world, in terms of total time spent on games. But for Klotzbach, it's the rate of growth being witnessed on non-gaming apps that is more fascinating. "Between Q1 of 2014 and Q3 of 2014 time spent on mid to long tail apps grew by 21 per cent. Time spent in the top 25 apps grew by only one per cent. So, we are seeing apps that are proving different services than your traditional top 25 gaming and social apps really driving the growth of app usage in India and Asia," he says. The implications of growing app usage are enormous for marketers. It could potentially impact email marketing too. Increasingly as e-commerce players shift to mobile apps, notification marketing could become more prevalent. Smart players are already moving into this space. For marketers, it's time to take note of these trends and apply in their playbooks.